SKEWER – There is no predator more potent upon Darwin IV than the sleek and wide-ranging Skewers. Even the feared Arrowtongues are vulnerable to its swooping attacks. Traveling in mated pairs or, less frequently, in small, flying pods upon the planet’s strong air-currents these predators are found from pole to pole. Bearing a huge, curved nasal-lance, they are almost playful in their methods of dispatching prey tossing their victims in mid-air from one to another until it is completely drained of fluids. One can find the shriveled husks of Skewer victims virtually everywhere upon Darwin’s surface. I really like the shapes and patterns on orcas and that admiration found its way into this piece. It was an early idea to do an aerial painting – a tip of my hat to all the aviation art I enjoy so much. The Skewers were always meant to be something of a deus ex machina, descending nearly unseen from heaven to lift off some pathetic animal, only to vanish as quickly as they appeared. 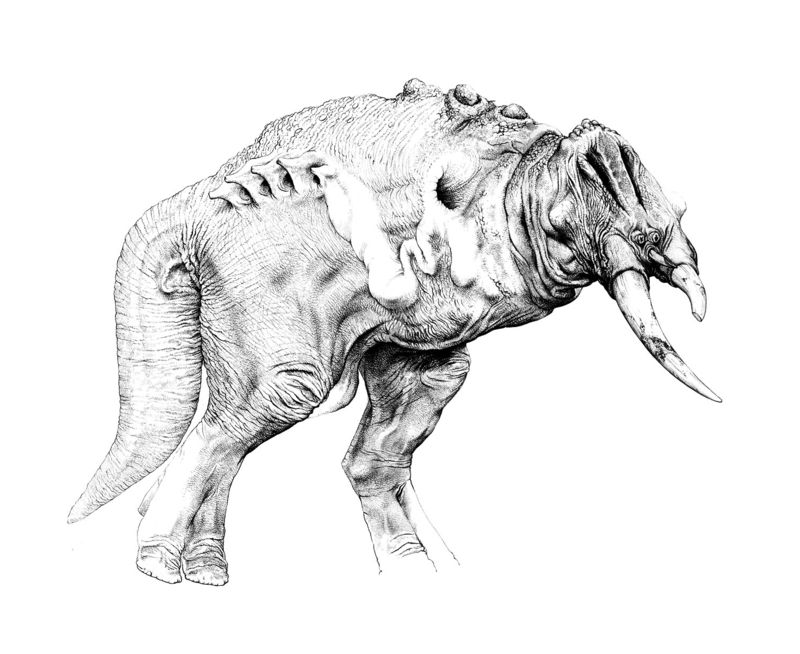 ARROWTONGUE – The Arrowtongue is one of Darwin IV’s most ubiquitous alpha predators. 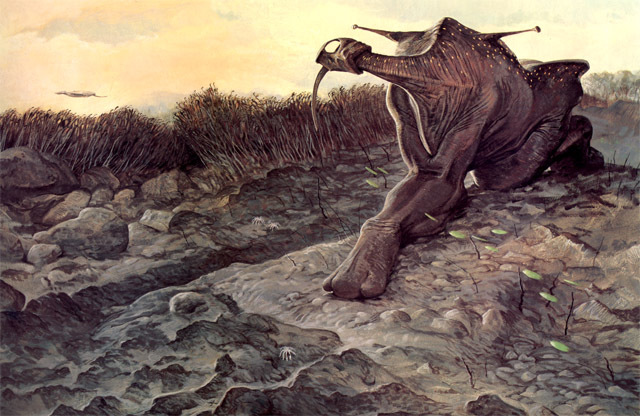 A mostly solitary hunter, the arrival of its dark form upon the plains presages a short and furious pursuit almost always ending in the death of some hapless Thornback, Prismalope or Littoralope. Bearing an enormous darting tongue, this aggressive liquivore was frequently spotted by expedition-members concealing itself amongst the electrophyte beds, taking advantage of those colonial animals’ electrical discharges to discourage the herds from approaching too closely. It is believed that the creature emits its ranging pings in concert with the electrophytes’ discharges, a habit that probably obscures its point of origin from prey animals. I really wanted this creature to be big and threatening, my version of what might have evolved along T-rex lines on another planet. The notion that what we were witnessing on Darwin IV was the evolutionary equivalent to the late Cretaceous era on our own planet was never far from my mind. BLADDERHORN – High above the waving succulent-seas of Darwin and hidden within the secret ravines of its mountains live the Bladderhorns. Solitary in their habits, these animals wander the mountain passes and high plains feeding upon the sub-surface bulbs of mountain flora. During mating season the chill air is rent with the sounds of their bugling, an eerie call created by the inflation an deflation of their antler-bladders. Upon encountering a rival, both Bladderhorns begin what can only be seen as an elaborate, if somewhat comical, ritualistic duel for dominance. Nothing like a bit of comic-relief in an otherwise savage eco-system. What could be odder than a blue, bipedal animal with antlers? No question that I was thinking about elk here. DAGGERWRIST – If there is any creature other than the floating Eosapien that exhibits well-developed social behavior upon Darwin, it is the arboreal Daggerwrist. Living exclusively in the dwindling pocket-forests of the planet, these roughly man-sized creatures travel in small bands, communicating with bursts of sonar pings and following the movements of their prey, the small, quick flyers called Trunk-suckers. Bearing piton-like forelimbs, gliding membranes and powerful ricochetal hind-limbs, the Daggerwrists are perfectly adapted for life in the tree-tops. This is, perhaps, the signature painting and animal from the book, a painting that seems to appeal to the public. 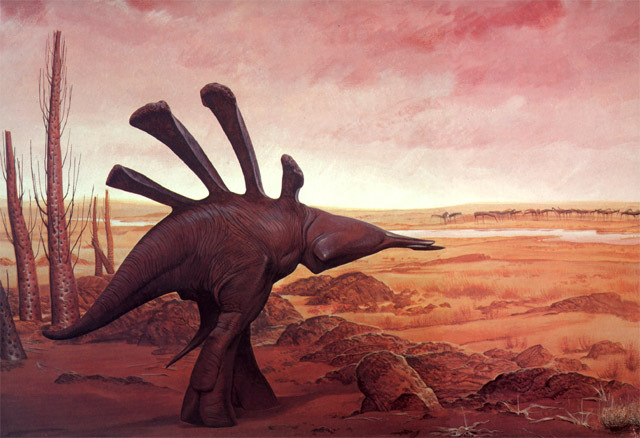 It is an intentionally iconic image of what was to become my favorite animal on Darwin IV. I’ve always wanted to go back and do a more in-depth piece of short fiction evoking Jane Goodall’s research, investigating these bloodthirsty animals, their social structure, their cannibalistic tendencies and, more interestingly, their interactions with humans. This was the second painting I did for my EXPEDITION proposal and, with it, I set some important templates for myself. There was to be no hair, no eyes or external ears. And while the biolights don’t appear in the late-afternoon light, they do show up in the second painting of the animal later in the book. RAYBACK – Smaller than its rival predator the Arrowtongue, the Rayback occupies a slightly different feeding niche upon the open plains of Darwin IV. 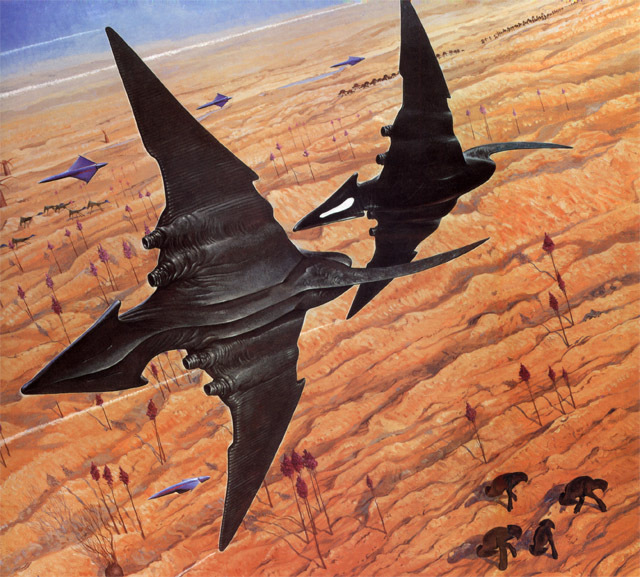 Faster and more agile, the Rayback can out sprint the Arrowtongue and, as a result, can tackle prey such as low-feeding flyers, young herd animals or ambushed Gyrosprinters. Notable for its particularly unpleasant temper, Raybacks will charge virtually anything that gets too near as was proven with almost comic regularity many times during the expedition. This was the first painting I finished for my EXPEDITION proposal. 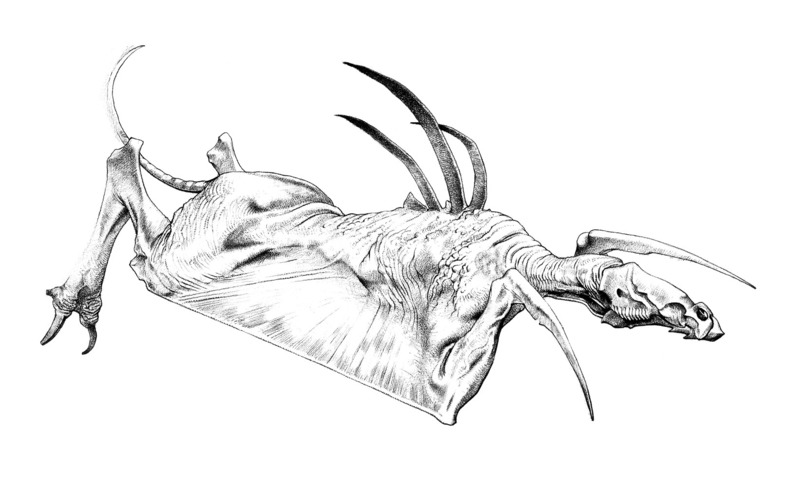 Not that I was aware of the project, as such, at the time; I had simply set out to do an alien wildlife painting. Like all of the other wildlife paintings I’d seen when I’d grown up – but different. After all, I was the son of two natural history illustrators. It made all the sense in the world to continue in their tradition and do wildlife art. I just had to do it my way. 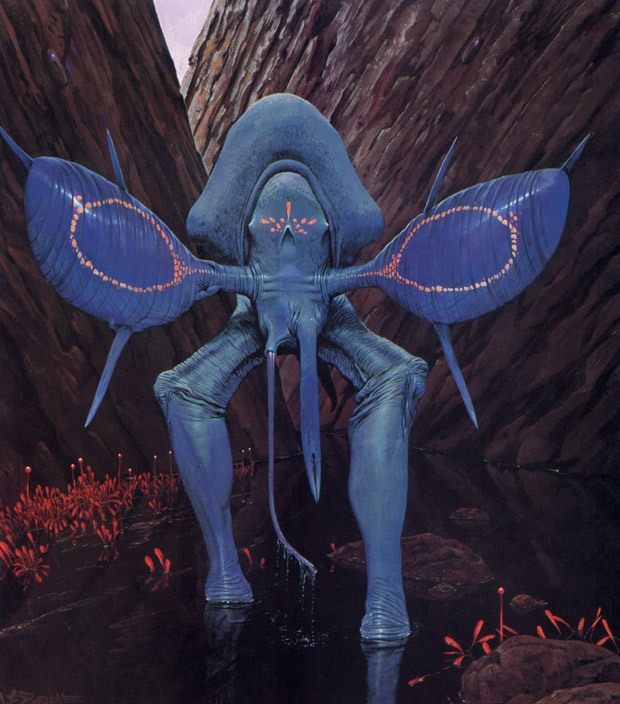 EMPEROR SEA STRIDER – The Emperor Sea Strider is the largest creature currently inhabiting Darwin IV. 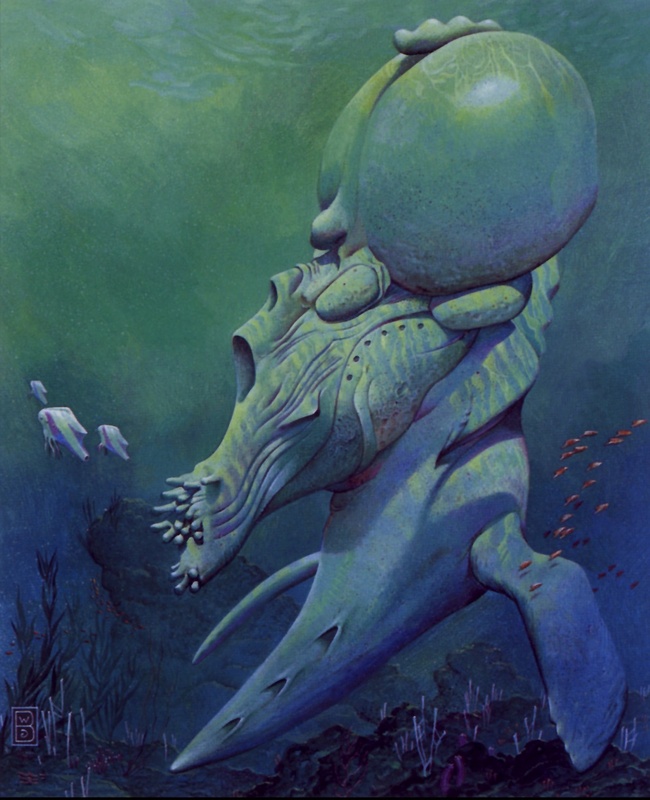 A denizen of the ‘Amoebic Sea’ this magnificent animal walks atop the sea’s yielding surface feeding as it moves, shaving off great chunks of sea-matrix with the mouths located in its enormous hollow feet. Something of an enigma, the towering creature’s internal structure seems to become more rigid and lightweight as it approaches its crown with the denser leg muscles and pelvis tissue keeping the center of gravity low. Ships at sea. That was unquestionably the spiritual underpinning of this piece. Writing and illustrating a book about alien animals can be a tight-rope act. On the one hand you want your audience to relate to the creatures, on the other, you don’t want the fauna to be pedestrian. Early on, I decided to make the majority of the creatures more or less “readable”. 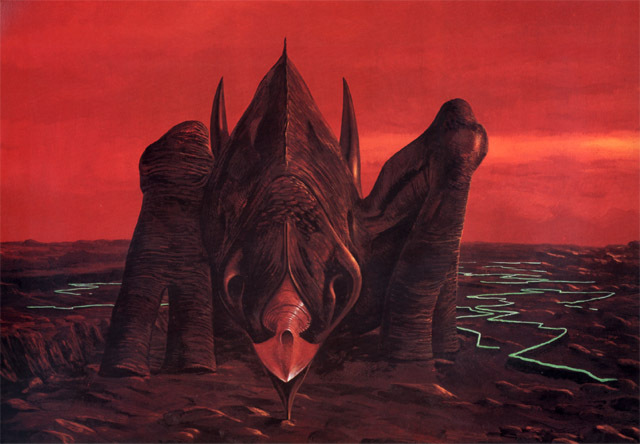 But after creating many alien animals that were, in my estimation, not quite as boundary-pushing as I might have wanted, I decided to mix things up and “evolve” one that was pretty outre. 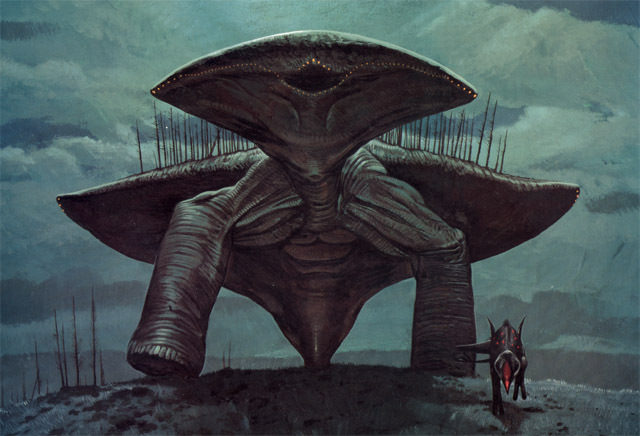 I know that I was thinking, at the time, “what would something like a giant, walking mollusk look like?” Here’s the answer. GROVEBACK – Strangely regular hummocks surmounted by small stands of shallow-rooted trees tell of the buried giants known as Grovebacks. 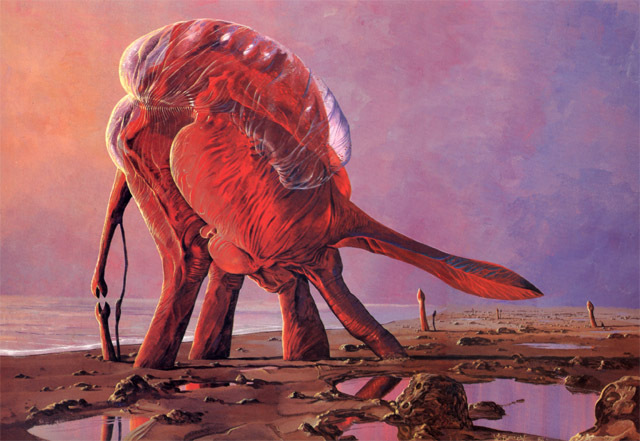 Spending the greater part of their lives dormant, these enormous creatures rise from the loamy soil to wander ponderously from one breeding ground to the next. Like many huge animals on Darwin, the Grovebacks are dependent upon a protein-rich food-source composed of tiny aerophytes, micro-flyers that sometimes darken the sky with their numbers. 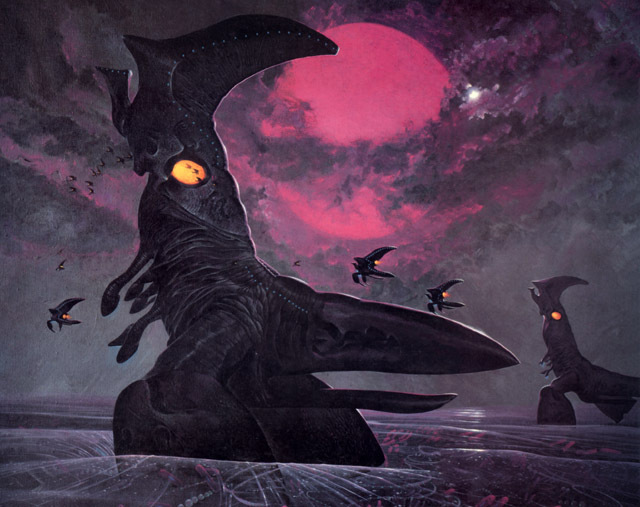 The Groveback’s rare emergence and subsequent feeding coincides with the equally infrequent, periodic expansion of the microflyer swarms. Gigantism is a big feature in EXPEDITION and, come to think of it, in all of my imaginative artwork. Obvious scale differences are a fun way for the public to easily put themselves in a painting and I’m sure that it’s that very element that so many find appealing about dinosaurs. 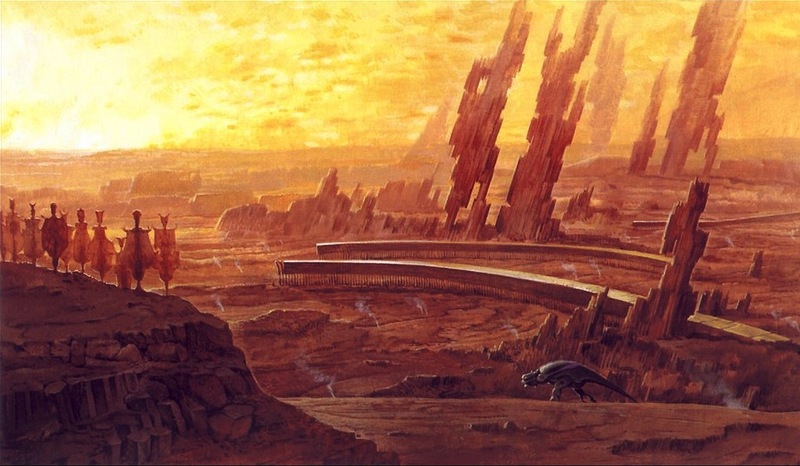 Physical motifs, like the broad curves on the Groveback, were used repeatedly throughout the book to convey a sense of shared evolution the planet. 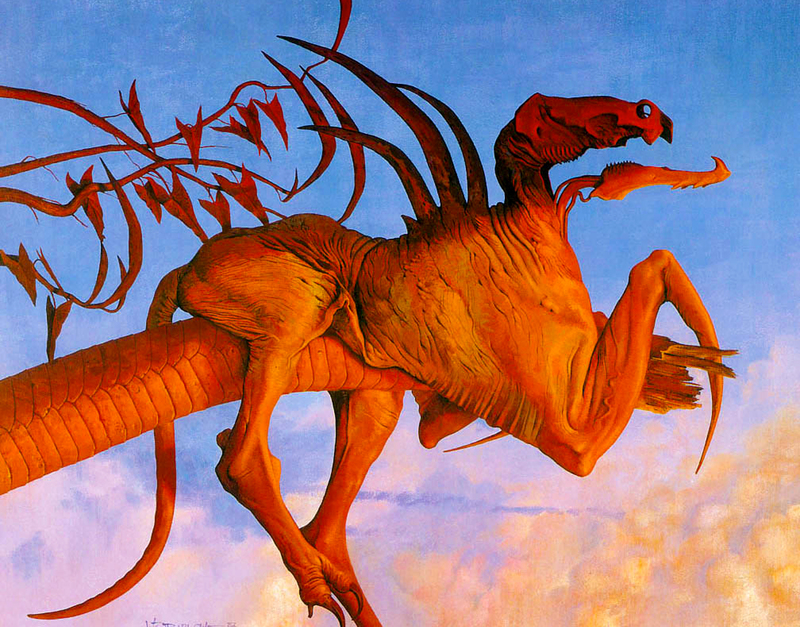 GYROSPRINTER – Careening across the plains on two powerful legs, the Gyrosprinter is Darwin IV’s fastest ground-dwelling creature. Equipped with a hyper-developed set of halteres for balance, the flexible-bodied animal can turn on a dime eluding most predators with ease. The relatively small, bony “head” or cephalon at the end of the creature’s neck serves two functions: it houses the primary sensory organs and is the protective, sheath-like tip for the animal’s long tongue. This is arguably my favorite painting in EXPEDITION. As one of the last ones executed, this is pretty much where I was heading from the beginning, but the journey had taken on a life of its own. If I had one thing to change about the physical rendering of the paintings in the book, it is that I would probably not have worked on stretched canvas. With that said, I think this is the most successful of the canvas pieces, a painting where, for me, the composition and technical application of paint seemed most satisfying. SAC-BACK – The periphery of the sprawling ‘Amoebic Sea’ is a bleak and inhospitable region. As the sea has been receding its margins have left a flattened landscape, the ‘Sea’s’ floor, as it were. Sac-backs roam these featureless wastes, walking with their awkward, three-legged gait from one group of buried females to the next. At each harem they will stop to either share their sack-stored food with their inert mates through their extended proboscises or mate with them in one of the more bizarre procreation rituals on the planet. The weird region around the Amoebic Sea seemed to me to be the perfect place to push the envelope in terms of designing stranger creatures. Also, when I began to conceive the Sac-back, I was nearing the end of my personal design odyssey and wanted to make sure that I had enough really odd creatures in the book. 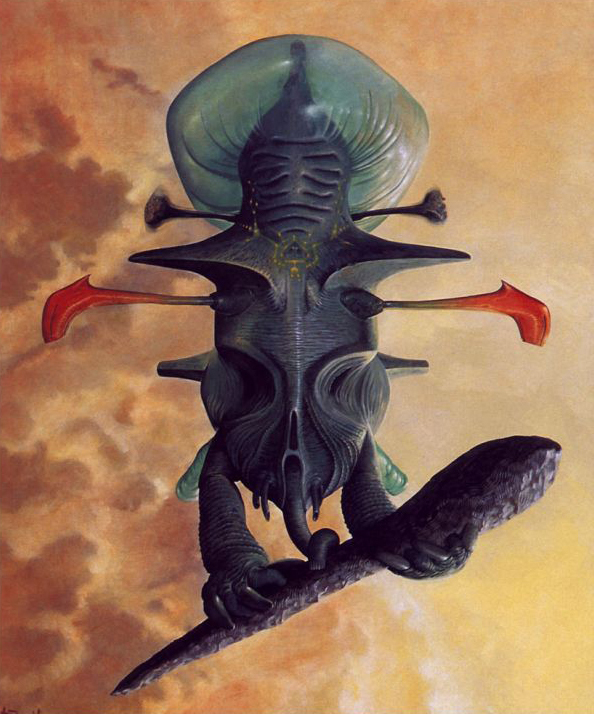 This creature is really an amalgam of biological principals: the horn-bill’s imprisoning of its mate, the camel’s fat-storing hump, the manner in which cuttlefish touch each other with their tentacles, all of these ideas found their way into this animal. Expedition II . . . . . . ?